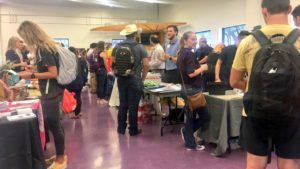 Concordia University Texas hosted its fall semester, part-time job fair on September 12th. Around 25 – 30 employers from fields such as restaurants, hotels, tutoring, and more joined Concordia at the event. During the fair, students were able to meet business around the area looking for part-time employees. Local businesses such as Amy’s Ice Cream, Moviehouse & Eatery, The Oasis, foundingAUSTIN, and others met with students seeking positions. At the job fair, employers had tables set up with information, business cards, and goodies. Students could sign up for jobs they had interest in and some employers even conducted interviews on site. Concordia will also host a career fair in March for students looking for full time positions upon graduation or summer internships. Randa Scott, Director of Vocation and Professional Development at Concordia is in charge of the job fair. She said that the part-time fair is really for students needing a job quickly and “Several of [the] local employers [who are] just minutes from campus [are] recruiting and some might even hire on the spot.” The fair is extremely beneficial to students, because they are able to meet directly with recruiters, which in turn saves time trying to find a job.